“Student Voices” is a unique research project highlighting interviews with graduate and undergraduate students who have had significant stressors and barriers while completing their higher education. The interviews include students from around the world including the U.S., South Africa, and Canada. A qualitative analysis of the interviews through a grounded theory research design is a key component of the project. This analysis is leading toward a model that will inform practice. To date, the emerging model has been labeled, “Believe In You.” The significant components of the model include emotional development, perseverance and self-efficacy. In the workshop, participants were introduced to an integrated approach to maximizing learning environments called TRPP illustrated to the right. The workshop participants listened to audio recordings of four interviews and read the accompanying transcripts. Based on this data, they developed codes and categories which will add another dimension to the emerging Believe In You model. Throughout this series, participants actively engaged in learning about “backward design” where course/program outcomes are considered first before content. We worked on developing learning objectives based on Bloom’s taxonomy that will lead to the mastery of competencies. From that point, we moved to the development of rubrics which create authentic assessments of learning and also facilitate self-assessment by the students. During the final session, participants worked in teams to develop authentic, active activities around a competency that was relevant to their course/program. 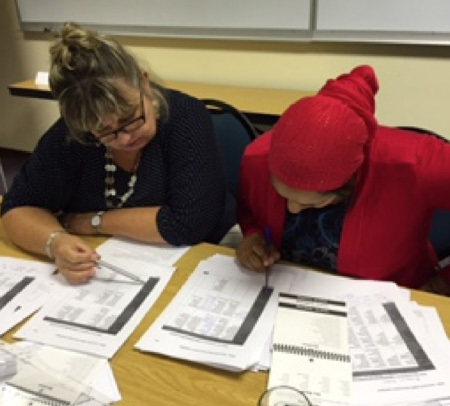 Participants were consistently challenged to apply the evidence-based practices that were presented to their own work. 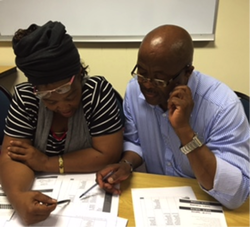 At the end of each session, they completed a rubric designed to inform the facilitator and themselves of their level of understanding.